Florida’s growing seasons sometimes doesn’t make sense to ‘town’s Executive Chef Scott Ostrander, who grew up on a farm in New York. But you won’t hear him complain about the availability of heirloom tomatoes in winter. Chef Scott celebrated the area’s wintertime agricultural bounty at the first Cooking in Season class last Saturday at his restaurant in Avondale. It was the first in a series of four classes organized by Sustainable Springfield to honor the growing seasons of Northeast Florida. Classes will include cooking demonstrations and culinary tips from the some of the area’s top chefs. 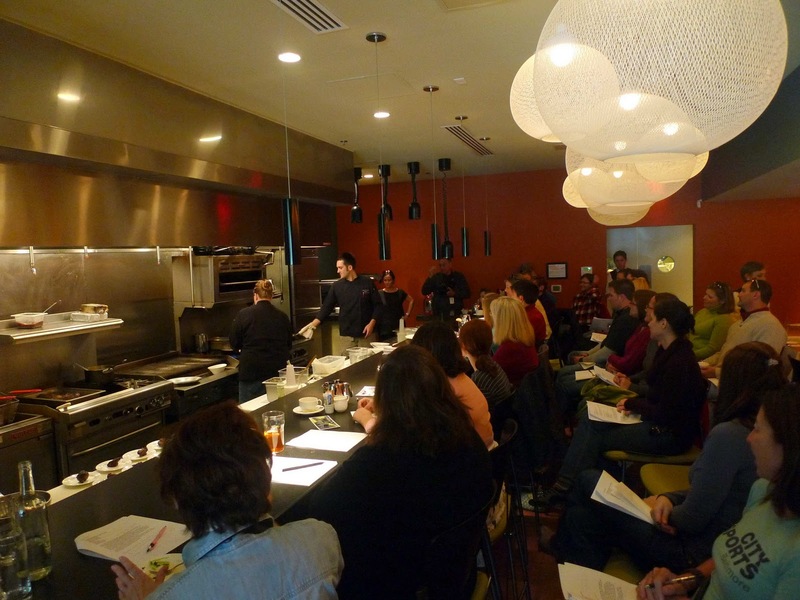 The real fun began when the chef demonstrated a few recipes using seasonal ingredients. First up was an heirloom cherry tomato salad with a snow pea shoot and arugula salad. 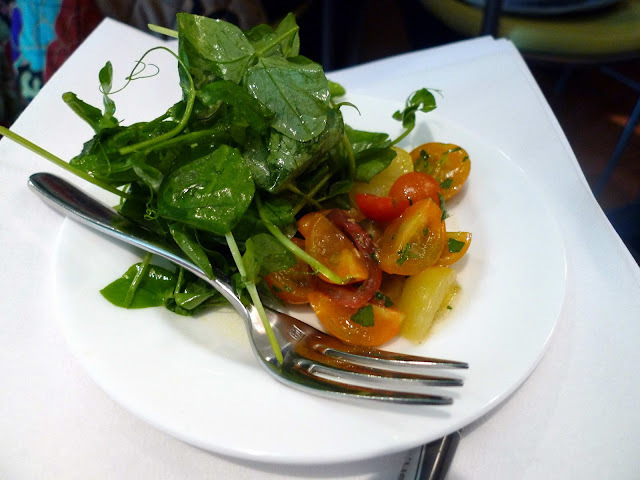 The sweet multi-colored tomatoes were tossed in a white balsamic vinaigrette with shallot and parsley then allowed to marinate for thirty minutes before being served with the fresh greens. He then demonstrated a recipe for coq au vin. Chef Scott marinated chicken in an aromatic red wine concoction, and flames danced high in the air as he seared the chicken and then transferred it to the oven to slowly braise. 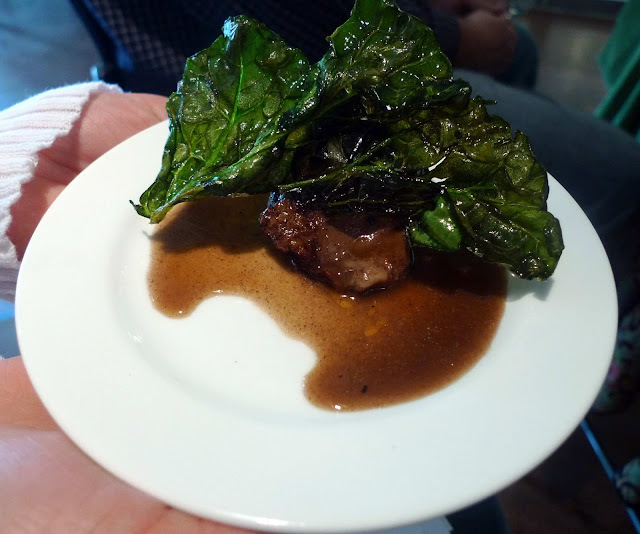 Guests sampled the tomato salad, coq au vin, and collard green “chips” –young collard greens that turned crisp and translucent when fried. We were then sent off with recipes and inspiration for preparing Northeast Florida’s abundance of fresh produce at home. October 15, 2011: Executive Chef David Bearl, Director of First Coast Technical College's Culinary Arts Program. Each class costs $40. Visit sustainablespringfield.net to reserve your spot for the spring class! My pleasure! My girlfriend and I had a blast. Looking forward to the next class. Sorry for the informal comment post. I can't seem to find any other way to reach you. I'd like to tell you about the Florida Film Festival's Film and Food Celebration. At FFF we love pairing great food with terrific films, and we invite guest chefs and speakers to bring the experience full circle.This year we're paying homage to our home state with the theme "Flavors of Florida". If you are interested in the press opportunities we're offering for this year's Festival (April 8-17), please e-mail me at marketing@enzian.org so I can get you all the info you will need.